As a consultant I’m on the road a lot and tend to work at different customers and sites. And some customers and sites offer limited internet access due to security policies. This means I’m not always able to connect to the PepperByte lab environment for testing purposes or to simply check a particular settings in our reference setup. So for my mobile offline days I was looking for a way to take my lab with me without having to carry a box full of additional hardware. Which basically translates into the need to run a VDI infrastructure on my MacBookPro, while keeping the costs of this additional lab environment as low as possible. I decided to give Oracle’s VirtualBox a go as it offers enough functionality to run a portable Citrix XenDesktop demo environment. And as I am running more and more NetScaler configurations for customers and having some fun with automating the configurations with PowerShell and NITRO scripting, I was very happy to discover that with some adjustments to the VM settings, it is also capable of running a NetScaler VPX as well. Which NetScaler VPX download to pick? 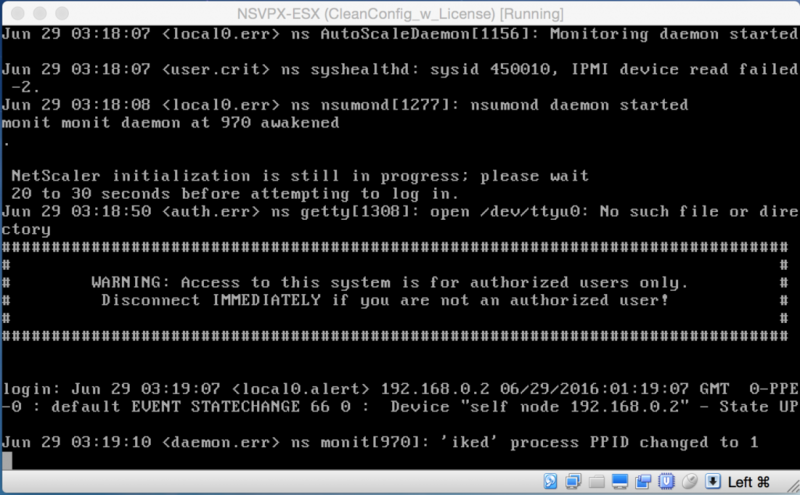 There is no VirtualBox download variant for the NetScaler VPX, so after finding this great forum post on virtualbox.org I knew I needed to select the NetScaler VPX for ESX download. Not only did the mentioned forum post tell me which Hypervisor edition to download, it also explained how I could tell VirtualBox I wanted it to run the VM as an ESX compatible VM by configuring some additional settings for the virtual machine. To configure the extra VM settings, you’ll need to use the VBoxManage commandline utility, which can be run from a Terminal session on your MacBookPro. VBoxManage setextradata [VM] "VBoxInternal/Devices/pcbios/0/Config/DmiBIOSVendor" "Phoenix Technologies LTD"
VBoxManage setextradata [VM] "VBoxInternal/Devices/pcbios/0/Config/DmiBIOSVersion" "6.00"
VBoxManage setextradata [VM] "VBoxInternal/Devices/pcbios/0/Config/DmiBIOSReleaseDate" "07/31/2013"
VBoxManage setextradata [VM] "VBoxInternal/Devices/pcbios/0/Config/DmiSystemVendor" "VMware, Inc."
VBoxManage setextradata [VM] "VBoxInternal/Devices/pcbios/0/Config/DmiSystemProduct" "VMware Virtual Platform"
VM: The name of the NetScaler VPX instance in VirtualBox. For example NSVPX-ESX. (Note: use double quotes when the name contains spaces). Keep in mind that running the NetScaler VPX in Oracle’s VirtualBox is a not supported configuration and should only be used for testing or developing purposes. Don’t use this configuration for production environments! ← E2EVC keeps you coming back for more!